"There are some strange animals in the Parisian jungle. I know everyone there, hunters and prey alike-a strange undergrowth, where it's the hare that follows the track of the hounds..."
"Will it be light tomorrow? Will there be blood and gold? Shall we hear the concert of gunfire? Shall we look down from our saddles upon our white-faced captives? Yes, it will be light tomorrow! The somber horsemen will ride along the mountain paths and the bold lords of the Black Coats will display the velvet of their cloaks, and everywhere there will be a name: mine, resounding like thunder..." The Colonel. Paul Féval, the father of the modern detective novel, turns Paris -- the beating heart of civilization -- into a dangerous jungle whose undergrowth shelters all manner of predators. 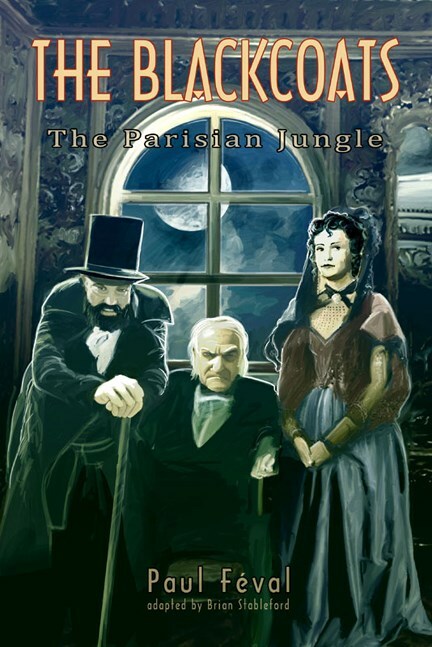 Written in 1863, The Parisian Jungle is the first in a series of crime novels depicting the exploits of the world's foremost international criminal organization, anticipating modern-day works such as The Godfather and The Sopranos. "The notion that crime fiction could be, and was destined to be, a full-blown literary genre emerges from The Black Coats." Brian Stableford. Les Habits Noirs (1863) by Paul Féval; Introduction, Afterword and Notes by Brian Stableford.